As a national/regional report, the Pending Home Sales Index cannot show local market data and, for that reason, it’s somewhat irrelevant to everyday buyers and sellers in Bronx. If you’re in the market to buy or sell a home today, it’s your local housing market data that matters to you. Standard & Poors released its monthly Case-Shiller Index this week. The Case-Shiller Index measures home price changes from month-to-month, and year-to-year, in 20 select U.S. cities. It also reports a “national” index; a composite of the values in said cities. 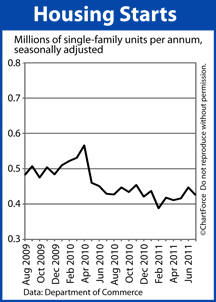 The most recent Case-Shiller Index shows a 0.9% rise in home values from June to July 2011. 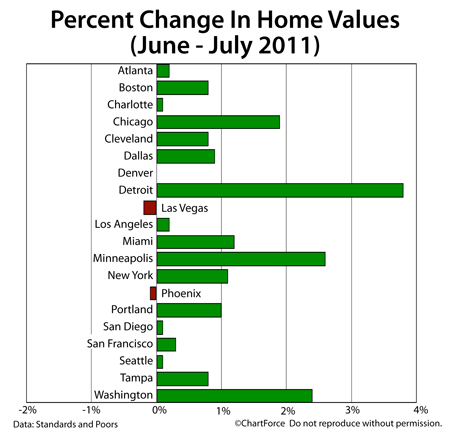 Home values were higher in 17 of the 20 tracked cities. Only Phoenix and Las Vegas fell. Denver was flat. Also noteworthy is that, of all of the Case-Shiller cities, Detroit posted the strongest 1-year, home price improvement. As compared to July 2010, home values are higher by 1.2 percent in Detroit. This bests even Washington, D.C. — long-believed to be the nation’s healthiest housing market. That said, we should be careful of the conclusions we draw from July’s Case-Shiller Index — both on a city-wide level, and on a national level. This is because, as with most “home price trackers”, the Case-Shiller Index has flaws in its methodology. The first Case-Shiller Index flaw is its limited scope. Although it’s purported to be a “nationa”l housing index, the data that comprises the monthly Case-Schiller Index is sourced from just 20 U.S. cities. These 20 cities represent just 0.6% of the more than 3,100 municipalities nationwide. The second Case Shiller Index flaw is that the sample sets include single-family, detached homes only. 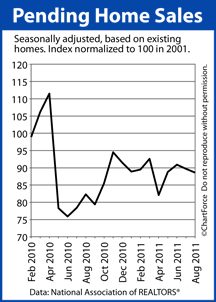 iCondominiums, multi-unit homes, and new construction are specifically excluded from the Case-Shiller Index. In some markets, “excluded” home types outnumber included ones. And, lastly, the Case-Shiller Index is flawed in that it takes 2 months to gather data and report it. It’s nearly October, yet we’re still discussing the real estate market as it existing in July. For buyers and sellers in Manhantten , July in ancient history. The Case-Shiller Index is useful for tracking long-term trends in housing, but does little to help individuals with their choices to buy or sell a home. 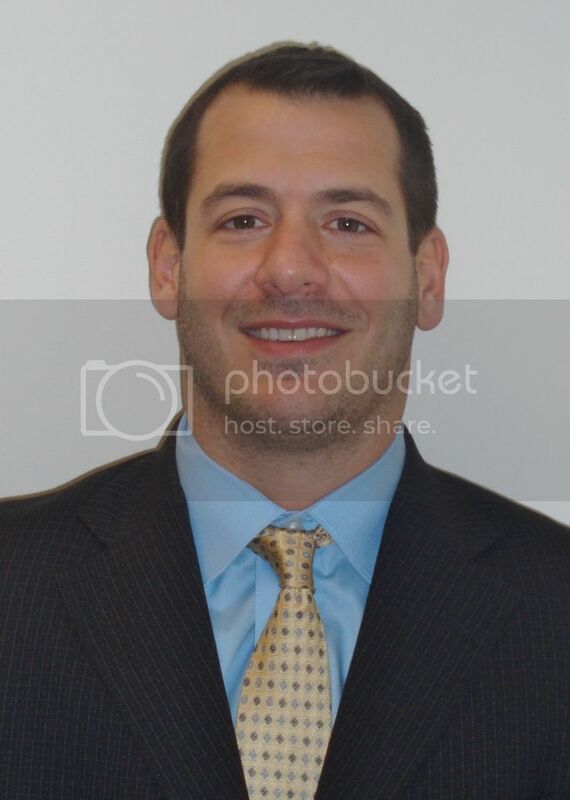 For relevant, recent real estate data, talk to a real estate agent in your market. Real estate agents are often the best source for real-time, real estate data. The new home market represents an interesting opportunity for home buyers in Manhantten. Builders are facing new competition from bank-owned homes and foreclosures, dragging builder confidence to all-time lows. Furthermore, builders have low expectations for the next 6 months. According to the National Association of REALTORS®, Existing Home Sales rose 8 percent in August from the month prior, and 19 percent as compared to August of last year. “Existing homes” are homes that are previously owned; ones that cannot be considered new construction. A total of 5.0 million existing homes were sold last month on a seasonally-adjusted, annualized basis. This is slightly better than the 12-month home resale average, a statistic partially powered by “distressed sales”. Distressed homes — homes in various stages of foreclosures or sold via short sale — accounted for 31 percent of all home resales in August. 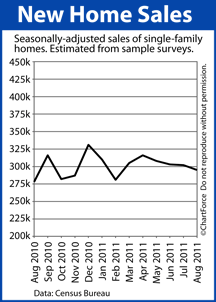 At the current rate of sales, the national home resale inventory would be depleted in 8.5 months. 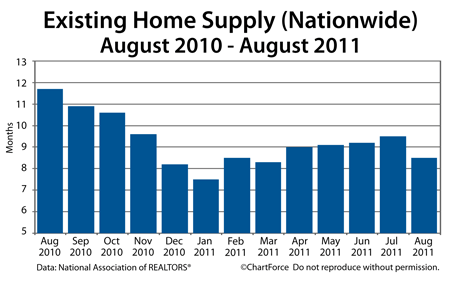 This pace is a full month faster as compared to July, and the lowest home supply reading since March 2011. Home prices throughout Manhantten are based on Supply and Demand and, at least right now, it appears the supply is dropping. Furthermore, with mortgage rates at all-time lows, it’s reasonable to expect demand to pick up. These two conditions should lead home prices higher. If you’re shopping for a home right now, recognize the trends and work them to your advantage. It may be “cheapest” to buy now. With the change of season, it’s a good time to make sure your home’s gutter system is clean and well-functioning. Home gutters serve a specific purpose. By capturing and funneling rainwater away from a home “footprint” water damage to walls, windows and roofing can be minimized. A well-functioning gutter system can keep a home’s basement from flooding, and a foundation safe from long-term structural damage. 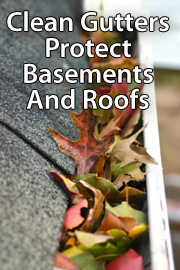 Damaged or dirty gutters can lead to major home damage that may not be covered by insurance. For homeowners in Valley Stream , keeping clean gutters is essential. Luckily, with the right tools, gutter maintenance can be a do-it-yourself job. First, gather the necessary tools. You’ll need a ladder for climbing; a bucket for holding debris; a hose for flushing your gutters; and a small, scooping tool such as a trowel. Next, carefully climb to your gutter. Using your hands, scoop large debris and place it in the bucket. Use the trowel to get to hard-to-reach places and for removing sticks and leaves. For safety, do not stretch to reach the next section of gutter. After clearing the first gutter portion, step down from the ladder, move it to the next section of gutter, and repeat. Do this until all gutter sections are free from debris. Next, find a garden hose with a spray attachment. Carry the hose up the ladder with you to the highest point of your gutter system — usually opposite the downspout. With the water supply on, spray water into the gutter to flush the remaining debris. If the water fails to drain, there’s likely a clog in the downspout. Using a screwdriver, separate the downspout, find the clog, and remove it. Or, if you find standing water, adjust the slope of your gutter by removing the gutter hangers, fixing the slope, and re-attaching the hangers. A gutter system should slope roughly one-quarter inch for every 10 feet of gutter. Gutter maintenance is a twice a year task that you can do yourself. However, if you’re uncomfortable on a ladder, or prefer to hire professionals, that’s okay, too. As with everything in home maintenance, it’s safety first. For now, housing remains steady. And, with mortgage rates at all-time lows, homebuyer purchasing power in an around Manhantten is higher than it’s been in history. If you’re in the process of shopping for a home, talk with your lender to plan your mortgage budget. 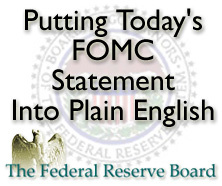 Mortgage market reaction to the FOMC statement has been positive this afternoon. Mortgage rates in New York are improving, but note that Wall Street sentiment can shift quickly — especially in a market that’s as uncertain as this one.